There are numerous stories about various food and drink products being introduced at the 1904 World's Fair in St. Louis. Such lists typically include iced tea as being "invented" at the 1904 Fair. In fact, iced tea is often attributed to merchant Richard Blechynden, a tea plantation owner. The story goes that he had planned to give away free samples of his hot tea to fair visitors. However, the St. Louis summer was so hot that few fair visitors seemed interested. It is said that Blechynden dumped some ice into his tea creating a drink that was a "hit" at the fair. On September 20 and 21, 1890, the Missouri State Reunion of Ex-Confederate Veterans was held in Nevada, Missouri. Fifteen thousand veterans converged on the city of Nevada including several hundred from St. Louis. This event was held at the Artesian Park where an encampment was set up with rows upon rows of tents. The encampment was called Camp Jackson. On the first day, a huge meal was served. The magnitude of this large barbecue is absolutely amazing even by today's standards. For example, over 11,000 pounds of beef was cooked. The biggest surprise however, is that the meal included iced tea - 880 gallons of it. Below is a clipping about that meal that appeared as a part of the write-up about the Confederate reunion that appeared in the September 28, 1890 issue of the Nevada Noticer newspaper. This article was published fourteen years before the World's Fair. It also seems notable that the article is written in a style that infers that the newspaper assumed its readers knew what iced tea was. 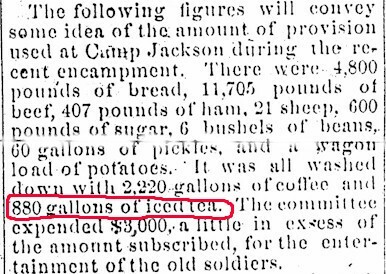 There can be no doubt that this clipping proves that iced tea was not "invented" at the St. Louis World's Fair and it inference is that iced tea had been around prior to 1890. This causes one to wonder if one of the St. Louis delegates remembered this drink and "re-invented" it at the fair. Or maybe the 1904 iced tea invention was just one of the many myths surrounding the World's Fair. Pat Villmer of the St. Louis World's Fair Society wrote that tea, " wasn't 'invented' at the World's Fair. The good people of the South were serving iced tea in their homes long before the Fair. It was just popularized at the Fair. It was called sweet tea served cool not hot in the summer in the South. Ice, when available, was used. Remember, ice was the premium in the early days before refrigeration, not tea." Even though it appears that not everyone believes that Iced Tea was "invented" at the fair, there are still numerous web sites and World's Fair references which declare that that is exactly what happened. It may have been popularized there, but this clipping definitely proves that Iced Tea was not a new drink in 1904. Reference: Nevada Noticer, September 28, 1890. Nevada, MO. This page is designed by Lyndon Irwin.